Of the many herbs I grow, the early spring vanguard are now sprouting enough greenery to be regularly harvested: chives, mint, parsley, sage and, that most underrated and underused of herbs, lovage. 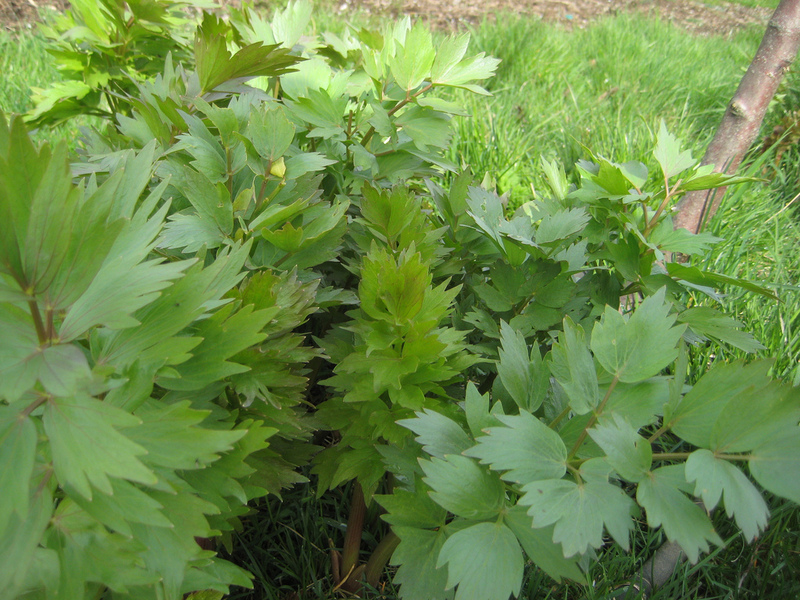 Vigorously unsheathing big flat leaves from erect, hollow, silky-smooth stalks, lovage is a low-maintenance hardy perennial with multiple culinary and medicinal uses. Yet it’s hard to find in garden centres or plant nurseries and packets of the cut herb in supermarkets are rarer than…than…than…I know…than a book in Tremorfa. Why this should be is partly explained by the plant’s name. Levisticum officinale is a native of Liguria in southern Europe, now part of Italy. The Romans originally called it ligusticum after the province before a late Latin bastardisation turned the word into levisticum. Then the plant was brought to the British Isles by the various monastic orders that were the religious troops of the Norman conquest and its name in French, levesche, was corrupted again to lovage to fit the phonology of early English. After a few centuries of being called lovage it was generally assumed among the ignorant and illiterate Anglo-Saxons that this meant it had some connection to ‘love’ and was therefore an aphrodisiac. The idea became embedded and was endorsed by the apothecary Nicholas Culpeper (1616-1654) in his famous Herbal of 1653. For exactly the same reason that men queued around the block outside drug stores when Viagra first became available in the US (ie: truth be told, when push comes to shove most blokes can’t get it up), lovage had a period of wild popularity. But the flaccid-cocked yeomen of Olde England were in for a disappointment (the only thing lovage will slightly raise is blood pressure, due to its aquaretic properties). By the 19th century lovage had been rumbled; its use as a libido-boost was written off as an old wives’ tale and it disappeared from cottage gardens. The other reason for lovage’s decline in popularity was its taste. The crude, infantile Brit palate, accustomed to stodge, burnt flesh and, increasingly, mass-produced cheap fodder, struggled with the entirely distinctive, adult and very strong lovage flavour; a unique amalgam of celery, aniseed and pepper plus an indescribable lovage-ness replicated by no other plant simply because it is the solitary species in the levisticum genus. Of course, debased Brit culture was wrong as usual: lovage is actually absolutely delicious, and all parts are edible. Young leaves and stalks can be used in salads and soups, older stems can be candied for cakes and biscuits, the seeds can be used in curries and breads and the roots can be added to stews and mashes. The default culinary use is undoubtedly in soups – time, methinks, for one of my (cough) ever-popular recipes. Incidentally, until very recently lovage was one of the few herbs for which there was no word in Welsh*. This is because Wales was up to its neck trying to repel the Anglo-Norman invaders by the time lovage first appeared here in the 14th century. Civil society, common law, communication, education and collective purpose were all in chaos, making coining words for new plants a luxury the country could not afford. This particular oversight was rectified in 2003 by Cymdeithas Edward Llwyd (the Welsh Naturalists Society), in co-operation with the Centre for the Standardization of Welsh Terminology at Bangor University, which has the job of producing new Welsh words in response to changing technologies and scientific discoveries. And so…lovage in Welsh is llwfach. *NOTE (2018) Jennifer Cairns has emailed with the information that she has discovered a Welsh word for lovage: Persli y Meirch (horses’ parsley). She found it in an 1890 book titled Y Llysieu Lyfr Teuluaidd (The Domestic Book of Herbs), written by R Price of Cwmllynfell and E Griffiths of Swansea. Well now, I had this mental image of bordars, cottars and divers other villeins trudging home after a hard day’s forage, tillage and pannage to a well earned pottage of cabbage with borage and, yes, lovage. All solid English fare. And now you’re saying it’s some posh foreign word like sausage, farage or garage. Poor show. And talking of shows, one of the best free shows in Cardiff, bluebells are out now on the Wenallt. Hats off to Alderman Hill-Snook. Make the most of them before the present Council sells it to the developers.